The mightiest of all heroic heroines is the amazing Amazonian Wonder Woman. For years this rough and tough superhero has been putting a stop to supervillain plans. Sometimes she does these good deeds alone or she is joined by a team of some of the greatest heroes ever assembled, the Justice League. Time and time again she has fought alongside Superman, Batman, and the Flash to save the world from total destruction. But during the night of Halloween this crime fighter takes a little break to collect a much deserved reward in the form of candy! 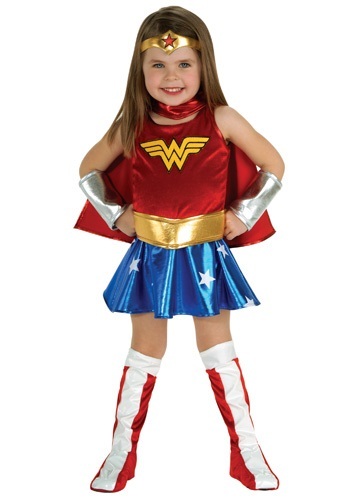 Give your little one the chance to fill the shoes of Wonder Woman with this superhero costume. Even if she's not ready to take on a whole world of villains, we're sure she'll be ready for a sweet candy treat!